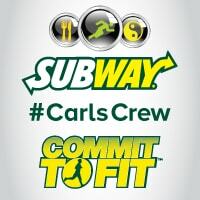 I’m over halfway done the SUBWAY Canada Commit to Fit Challenge with only two more weeks left. Time has flown by! I last updated you in Week 3 about my challenge of finding a friend to help me stay motivated in the challenge. I really wanted John to come out for a walk with me. He’s been complaining about being overweight and has mentioned a few times before that he would like to start walking. However, saying you want to and actually doing it are two completely different things. Over the course of the week, I planted the seed in his head about joining me for a walk. Finally on the weekend, he said he wanted to come – success! It was great having him along and I enjoyed our chat. We talked about the houses in our neighbourhood and stopped at the local park for a few minutes. John joked about staying at the park and have me walk home get the car and go pick him up. I told him no way! Thankfully he was kidding. Carl sent us over our challenge for Week 4 and it was an easy one for me: take your workout outdoors. I was already doing that with my walks. However, this week, we’ve had a lot of rain so it kept me away from my walks in the neighbourhood. In the end, week 4 has been a challenge surprisingly since this one should have been super simple for me to do. Today, for example, is dark and overcast and looks like it will rain any second. I know I shouldn’t sit inside and wait for “the right moment” to begin because who can predict weather??? I will stick closer to home than I normally do in case I have to make a mad dash inside if it starts to downpour. Next week I have a nutrition consultation with Helene from HC Nutrition. I’ve never had one before so I’m looking forward to what she has to say! I like short body weight workout videos on YouTube. It’s easy to mix things up. My favorite workout is doing a DVD. My fave is also walking. My favorite workout is walking the dog (or uh, the dog walking me). I like doing cardio on the elliptical machine. mine is walking..I once lost 15 lbs just walking about 40 mins per day for about 2-3 months..I stopped..I have need to get back in to walking. Rollerblading! Although I rarely have the time and the inclination in the same moment. I also love to walk. Mine is walking or the elliptical is it’s raining. I love my cardio machines – especially the rowing machine. I love the elliptical trainer. Does a great number of my bum and thighs. My your favourite type of workout is walking. also walking….I have had bilateral knee replacements and am still regaining the strength in my legs. I love going to workout classes although I can never find the energy to go. I also really enjoy brisk walking while listening to music. Swimming, although I haven’t gone swimming for a while. Walking is also my fave exercise. Running is a fav. Thanks for the chance.